The random number generator used in experiments which led to the creation of Spirit Story Box Ghost Hunting Tool. Jill and Roger Pingleton, the founder and lead investigators for Scientific Minds (SciMinds) Paranormal Investigators are also the co-creators of the iOS ghost hunting tool, Spirit Story Box*, which is available on the Apple App Store for the iPhone. It’s a fascinating app to be sure, and the story behind the creation of the app is just as fascinating. Jill and Roger studied the Global Consciousness Project which uses random number generators that seem to be influenced by the whole of human consciousness. This Princeton sponsored project explores meaningful correlations between human consciousness and data which should be random. Distributed random number generators (RNGs) produce data that should always be random, but alas researchers found that during tragic events such as the 9/11 terrorist attacks, the data becomes statistically more ordered (less random). This seems to suggest that human consciousness can have a physical effect on these devices, or perhaps randomness in general. Jill and Roger wondered if paranormal activity could similarly skew random data produced by RNGs on a localized level. In other words, do RNGs produce non random data during paranormal activity? To test this, the SciMinds team needed three things: a reliable random number generator, a test suite for analyzing random data, and a haunted location. Producing truly random data isn’t as simple as it sounds. If the data contains any sort of repeating pattern, it isn’t truly random. The most reliable random number sources use electronic noise, similar to static on a radio tuned to an open channel, which is then quantified and turned into data. Professional RNGs can cost hundreds of dollars, but luckily a man named Rob Seward had created a low-cost electronic device which produces truly random data using transistors with a reverse-biased PN junction. 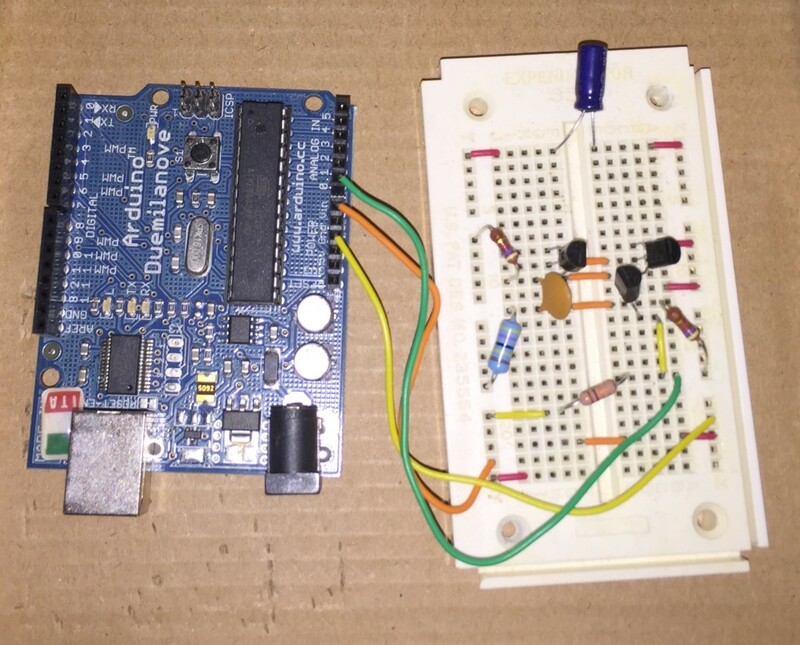 The output of this device is fed into an Arduino micro controller which collects the data and sends it over its USB port. With additional simple software, the team was collecting random data, but how did they know the data was truly random? As it turns out, testing for randomness is not as simple as it may sound. This geeky subject is beyond the scope of this article. You can read a little about the subject at random.org. Again, as luck would have it, the National Institute of Standards and Technology (NIST) developed a suite of tools to test data for randomness. With this suite of tools, SciMinds was able to test their device. The results were promising. The device performed very well. All that was left was to find a suitable haunted location. Willows Weep is the name of a house in Eugene, Indiana, which has produced an impressive volume of paranormal evidence in its short tenure as a paid, haunted venue. It is owned and operated by Brenda Zimmerman, who admittedly is afraid of the house, with good reason. She is among many who have been attacked either in or around the house. A quick Google or YouTube search produces some compelling results. We’ll save the history of Willows Weep and spirit stories for another article, though. In short, SciMinds found a virtual paranormal laboratory at Willows Weep. The night when the team decided to run its first experiments, nature had a surprise in store for the researchers. After their equipment was set up, an intense electrical storm rolled through. As the team sat in the dark, loud claps of thunder reverberated through the building. There are many who believe the ionized air after a storm can feed spirit activity. The main experiment was simple. Collect random, time-stamped data while cameras and audio recorders documented the experiences of the paranormal investigators. Only after the investigation would the random data be analyzed and matched with suspicious activity. Blinding the study in this way increased the reliability of the results. If the random data became nonrandom at the same time the investigators were experiencing odd activities (knocks, disembodied voices, shadow figure sightings), a correlation could possibly be made. As luck would have it the RNG began producing nonrandom data precisely when the investigators in the house were reported hearing knocks and strange sounds which occurred well after the thunder had subsided. These noises were also captured by the audio recorders. At times, as many as seven recorders were capturing audio. Though this experiment would need to be run many times to be considered scientific, it was a moment that opened Jill and Roger’s eyes to the possibility that a RNG could be used as a spiritual communication tool. The creation of Spirit Story Box and the principles behind how the device works have been recounted by Jill and Roger many times. The two have not been shy about speaking to the media. Though the specifics of the algorithm are proprietary, the principles behind its operation are not. Similar to the RNG experiment, the app analyzes a stream of data, which should be random, and looks for non randomness. When sufficient order is observed it is paired with a word or words. Spirit Story Box is unique among similar apps in that it can also speak phrases. Those who would say that it is a random word generator are 180 degrees from the truth, the creators feel. The app looks for order in the chaos. It’s that order that is unnatural in this case. If you have an iPhone, try the app for yourself. At under a dollar, it may be one of the cheapest ghost hunting tools on the market.